“The Future (Scares the Sit Out of Me).” 4/1/14. Acrylic and spray paints, with ink. 24×48″. I had two poems I wanted to recite. They’re really bold. The kind of stuff that I’ve held off even from sharing on my website. A lot of my writing is painfully honest and extremely vulnerable but these are on another level. I didn’t know if I’d have the guts to share them for the first time from a stage. I also had some “material” that I thought would work as a stand-up routine. In the end, I didn’t prepare myself for poetry or comedy. About halfway through the night, I remembered that I had said I wanted to perform and – as tempting as it was to not bring it up and not take the stage – I didn’t want to be all talk. I had said I was going to get on stage, so I was going to get on stage; it didn’t matter how scared I was. I decided to just tell my story and then speak off the cuff about some of my pieces. I chose a couple dozen and put them in an order that’d flow well. Rosaly said I’d go up in forty-five minutes. I was nervous. I scratched it out onto the canvas I had started that night. The room had maybe thirty people scattered across it. Some of them continued to have conversations while I spoke. I just went on ahead and didn’t let it get to me. One guy in the back of the room started heckling me. He said I should’ve killed myself. He called me a “jerk-off.” I kept going. It helped that I couldn’t make out everything he was saying. I wrote the statement for this piece three weeks ago but held off on sharing it until I had a good photograph of the painting to share. I’m really happy to report though that the weeks following what I’d describe as a painting “about ambition” have been some of my most successful. The rate at which I’m moving forward this month has been a little unbelievable. And while I’m definitely not going to allow myself to sit back, become complacent, or breathe too easily, I’m really happy with where I’m at today. I’ve been slacking on updating my blog regularly but this week should be a relatively quiet one, so – in the next few days – I’m going to spend a little time detailing this last (incredibly eventful) month. (Though anyone that follows me on Facebook probably already has a pretty good idea). 1) My exhibit at The Silver Cow has opened and closed. 2) Issues of Folio Weekly featuring the article about me are still on newsstands for another couple of days, in and around Jacksonville. 3) My original pieces are no longer on display anywhere in the city of Jacksonville but I have about two dozen different prints hanging (and for sale) at Burrito Gallery (21 E. Adams St.), probably for another two weeks or so. 4) My run in Jacksonville is officially over and I’m currently focusing on Delray Beach (for an as yet undetermined length of time). While here, I’ll be operating primarily out of/in conjunction with Ettra (149 NE 2nd Ave) and will have more details concerning that later in the week. 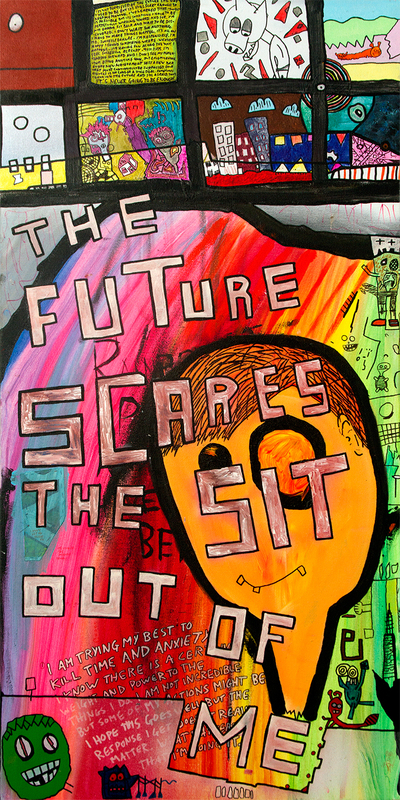 5) “The Future Scares the Sit Out of Me” is available as a 7×14″ print (if you can find me! ); the original painting is already sold.